So, as I entered my second year at Nipissing, I decided to “get involved” –what exactly that meant, I wasn’t sure – but I was determined to find a niche. 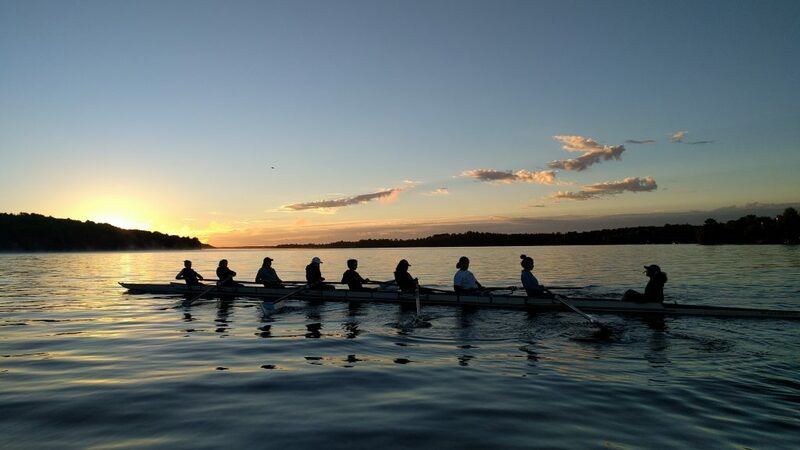 When I discovered that Nipissing had a rowing team, I decided to give it a try and, to my surprise, I quickly grew to love the sport. Again, I won’t glamourize things: being a member of the rowing team meant a lot of hard work. 6:30am practices, numb feet in the frigid fall waters of Trout Lake, and sore, blistered hands are all realities for a novice rower. And, for anyone who has ever rowed before: 2k ERG tests – enough said. However, for anyone considering the sport, I promise that the sleepy mornings, cold feet, and blistered hands are worth that blissful moment when dawn breaks and the sun rises over the serene waters of the lake. It’s breathtaking. But perhaps even better than that is the team you have the privilege of rowing with. I had the opportunity to meet some amazing people and foster key competencies along the way. Rowing teaches you to work with a team as a single cohesive unit, push yourself past your limits, and to be patient (yet committed!) with yourself as you are challenged with new skills. This year, I am an assistant to the team, and coxed our novice crew at the Head of the Trent regatta. As someone who prefers to linger in the background, coxing pushed me out of my comfort zone to lead a team and take charge. It’s not just about the sport – the skills and attitudes that rowing instills within you are applicable in almost every facet of life. So, that’s enough about me. Let me ask you: What are you doing here at Nipissing to make your university experience memorable? What can you do with your time that will not only be enjoyable, but also a valuable opportunity for self-development? First years, yes, I am talking directly to you, do not waste this year like I did. Get involved now. Learn about what Nipissing has to offer, and, if there is nothing that appeals to you, start something that does!